November 30th. After spending some 17 hours in transit I looked towards the view from my window seat. The clouds looked like acacia trees. The cars were moving on the interstate. “This must be Nairobi,” I thought. After a peaceful landing, we quickly exited the KLM plane. For a nation that is very laid back, we exited the international flight much quicker than many of the domestic ones I’ve traveled on in the USA. I went to the washroom after exiting the flight. Amazed by the cleanliness of the restroom I thought, “Why can’t we take this kind of pride even in the simplest of jobs of cleaning back home?” As I left, we headed towards immigration. Jambo. 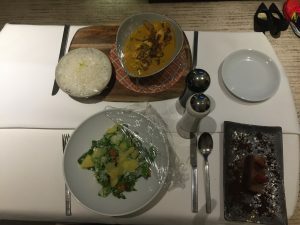 Karibu. Hi. Welcome. As we waited on the immigration line, we took care of business again with our bank to tell them that we were using our own card (the irony of living in a technological age which promotes simplicity). As we waited, an impatient woman started complaining about how the lines weren’t moving fast enough. Steve Harvey’s 2008 comedy special immediately entered my mind: “Now Africans, when you trippin’, they get cooler.” The man at the immigration booth acted real smooth towards her. After our passports, visas and fingerprints were scanned, we left to pick up our luggage and headed outside. The atmosphere once exiting the airport is one I will never forget. Nairobi reminded me of Florida, only with few mazungu (that’s a white male; no worries, it’s more a term of endearment rather than a racial slur), at altitude and on the other side of the world. Everyone knew running. 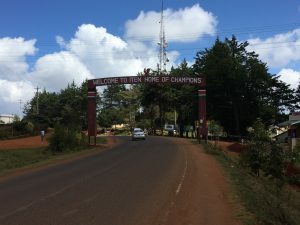 When I mentioned Iten to the locals, they said, “Oh, the home of champions. 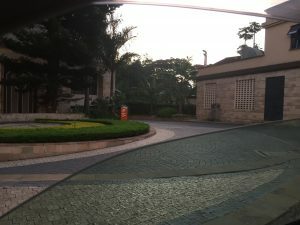 That’s where the athletes practice.” We found a driver, Francis, and headed towards our hotel in the Westlands. We managed to avoid all the traffic, but we did not avoid talking about the one thing I hoped to evade this trip. “How about your president elect,” Francis asked. “Ugh,” I thought. It wasn’t the last time the conversation came up, but everyone from coaches to world-class athletes nodded in agreement to what we thought. As we entered the Westlands we passed the hotel where Barack Obama stayed at during his visit in 2015. I remembered that event well because it occurred during my first marathon in San Francisco. Little did I know that over a year later we would stay near the place on a running trip. We arrived at the dusitD2 hotel and checked through security. The workers kindly took our luggage and screened it. It felt like entering a highly secured building in New York City, only less chaotic and friendlier. 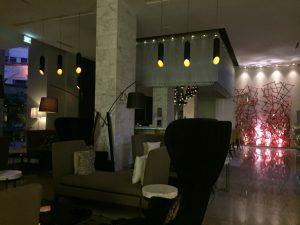 We thought, “Surely some diplomats must stay here.” Once I turned on the lights with the hotel keycard, I turned on my phone and read through all the kind messages my friends and family sent during a 24-hour period. My wife, Cherbrale, wanted to explore more of the hotel lobby. She felt the need to change into a dress and heels to look like she belonged. I took a hot shower instead. After ordering food, we slept for a few hours before heading back to the airport to fly into Eldoret. 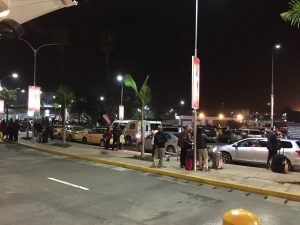 We promptly checked out at 6 am to head back to Jomo Kenyatta International Airport. 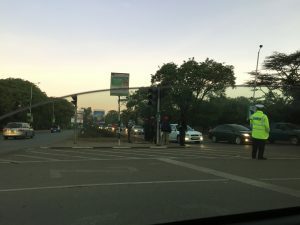 Francis recommended that we arrive early to avoid two straight hours of Nairobi traffic. Once we checked in we had breakfast and waited for our flight. Fly 540 had to have been the easiest and most laid back airline I’d ever experienced. Sit down, buckle your seatbelt and basically we are taking off right now in the same, cool African tone shared by the flight crew. By the time everyone drank their Coke and finished eating their tea biscuits, we landed. 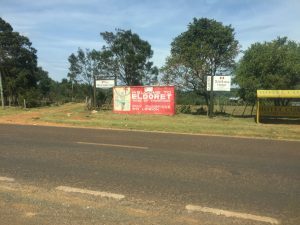 Eldoret had a different feel, but with the same openness and kindness we experienced in Nairobi. We saw the dirt paths, farmland and all the posters relating to sports.